Jane Austen's witty comedy of manners is one of the most universally loved and admired English novels of all time. Spirited Elizabeth Bennet is one of a family of five daughters, and with no male heir, the Bennet estate must someday pass to their priggish cousin William Collins. Therefore, the girls must marry well—and thus is launched the story of Elizabeth and the arrogant bachelor Mr. Darcy, in a novel renowned as the epitome of romance and wit. 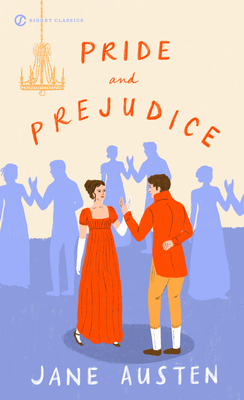 Pride and Prejudice is Jane Austen’s masterwork, an entertaining portrait of matrimonial rites and rivalries, timeless in its hilarity and its honesty. Jane Austen (1775-1817) was born in Hampshire, England, to George Austen, a rector, and his wife, Cassandra. Like many girls of her day, she was educated at home, where she began her literary career by writing parodies and skits for the amusement of her large family. Although Austen did not marry, she did have several suitors and once accepted a marriage proposal, but only for an evening. Although Austen never lived apart from her family, her work shows a worldly and wise sensibility. Her novels include Sense and Sensibility (1811), Pride and Prejudice (1813), Mansfield Park (1814), Emma (1815), and Northanger Abbey and Persuasion, published together posthumously in 1818. Margaret Drabble is the highly acclaimed novelist, biographer, and editor of The Oxford Companion to English Literature. Her novels include The Gates of Ivory, The Seven Sisters, and The Red Queen. New York Times bestselling author Eloisa James’s historical Regencies have been published to great acclaim; People magazine raved that “romance writing does not get much better than this.” Her numerous novels have repeatedly received starred reviews from Publishers Weekly, and regularly appear on the bestseller lists. James is also a professor of English literature at Fordham University.